If you have Uploaded Artifacts into the Customer Documents section of the current Object, it is permissible to link them to Requirement Statements in the Assessment for a more efficient document tagging method. 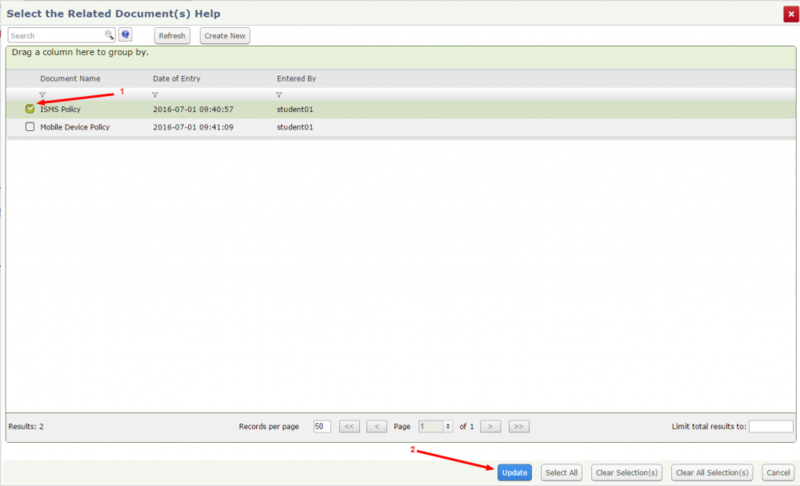 On the HITRUST CSF Requirement tab is an attribute titled Select the Related Document(s): with a blank field underneath containing a magnifying glass icon. If you select this icon, a listing of all previously attached Customer Documents for this Assessment will emerge. Select the relevant options by checking the box adjacent to the title, and save by pressing the blue Update button positioned at the bottom of the form. *The Assessor Documents will not be visible in this element. You will notice that the field is now populated with the values you have chosen. *The Document links are clickable and will navigate you to the appropriate files. This will occur if there are no contents in the Customer Documents component for this Assessment. Quickly add a Customer Document from the HITRUST CSF Requirement Tab by clicking the button adjacent to the Related Documents attribute.